Cairo Stories: Ideological, Cultural And Economic Issues Facing Women In Egypt Today. How are women in today’s Egypt navigating the structures of the nation state: social systems, economic responsibility, and familial ties in a changing urban landscape? This panel brings together leading journalists, urban scholars, and artists to discuss the current political and social climate in Cairo. The Cairo Stories panel is produced in association with the exhibition …cairo stories by artist Judith Barry, presenting oral histories from more than 215 interviews Barry conducted with women of varying social and economic classes in Cairo between 2003 and 2011. It continues an on-going series of as-told-to recorded stories, based on personal interviews conducted by the artist. Lina Attalah is the co-founder and chief editor of Mada Masr, a Cairo-based news website. She has been a journalist for over a decade, covering primarily Egypt and the region, including the Syrian revolution and the Iran 2013 presidential elections. She was previously the chief editor of Egypt Independent, another Egyptian leading English-language news media. 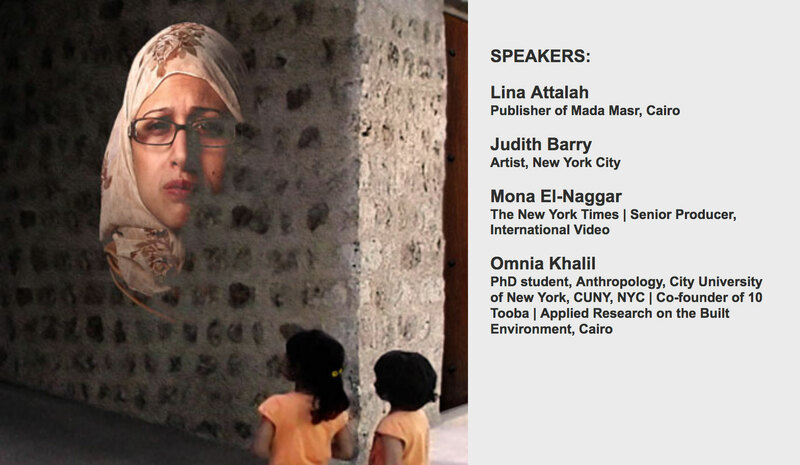 Omnia Khalil is PhD student, City University of New York (CUNY), anthropology program. She is co-founder of 10 Tooba| Applied Research on the Built Environment. Her current research titled “Urban Geographies of Violence in Post-Revolutionary Cairo” focuses on forms of violence in a local community of Bulaq Abulella in Egypt. She is an engaged scholar and urban anthropologist and has over ten years’ experience in social mapping and participatory community urban action planning. Omnia was heading a participatory community action plan in Ramlet Bulaq and was a post MA fellow in the anthropology department at AUC, where she finished her thesis in cultural anthropology. Her MA thesis is titled “The People of The City, Space, Laboring and Power; Unraveling the How in Ramlet Bulaq”. During her MA research, Omnia participated in a one-semester exchange program with Jawaharlal Nehru University, Delhi, India.